Following a series of monographic exhibitions held in Europe and North America between 2008 and 2011, this publication offers a first survey of the multi-facetted work of the Austrian/Canadian artist Klaus Scherübel. Comprised of seven volumes, "VOL. 13" documents and analyses some of his best known projects of the last twenty years, including the series "Untitled (The Artist at Work)" as well as his book projects dedicated to the literary and conceptual enterprises of French poet Stéphane Mallarmé and fictional writer Jack Torrance, known from Stanley Kubrick's modern horror drama "The Shining". 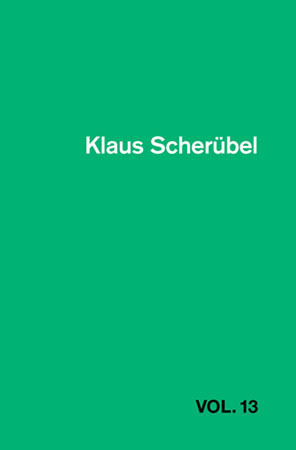 Scherübel has personally taken charge of the conception of this book - in the process giving us a publication that is both about his self-reflexive artistic approach and an extension of it.